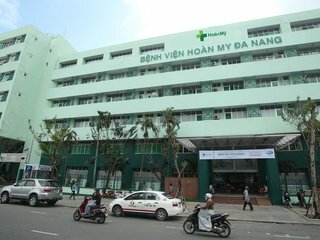 With a developing population, Danang Vietnam is fast becoming a modern world-class city, but it has managed to retain its cultural charm. Highrise buildings stand adjacent to local markets and cyclos are still present in traffic despite the growing emergence of cars. Established by the Champa Kingdom in the 2nd Century, the name Danang derives from the Cham word for ‘opening of a large river.’ Recognising its value as a major port, French imperialists began their Vietnamese campaign in Danang Vietnam and the city rose in prominence. Now, it is the fifth most populated city in the country. 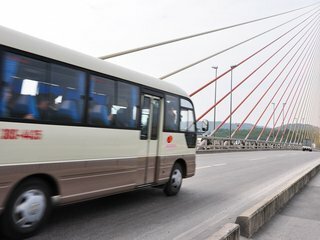 As Vietnam’s leading centre of urbanisation and industrial production, Danang’s economy is growing and diversifying to include everything from textiles to aviation technology. For a look at Danang’s historical commercial hub, browse Han Market for an extensive array of consumer goods and souvenirs. The surrounding area is known for its natural wonders, most notably the stretch of beaches offering pristine sand and gentle waters. In the mountains, head to Bana Hill, a former French hill station converted into a vacation hub. With hotels, restaurants, historical sights and a children’s Fantasy Park and arcade, this idyllic jungle hideaway is perfect for the whole family. Take a closer look at the area’s Champa past at the Museum of Cham sculpture. The architecture of the museum itself is an intriguing fusion of French colonial and facets of the classic Cham style. The museum houses over 300 artifacts that cover the main period of Champa power, from around 500AD to the empire’s demise in the 15th Century. During the American War, many US and Australian servicemen relaxed on the pure sand of the beach they called ‘China Beach’. The beach was the focus of the quirky American TV drama series, also called China Beach. 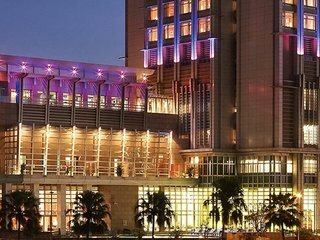 With its beach-side hotels and seafood restaurants, it’s still a great place to hang out. 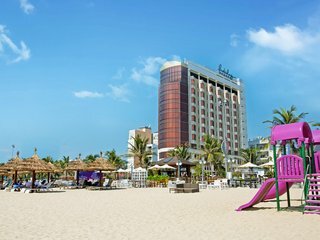 Talking of beaches, hotels, resorts and restaurants are springing up Danang Beach is rapidly being transformed into the next big beach resort. Danang city itself has a 4 kilometre sweep glistening sandy beach where travelers can draw breath and soak up the sun. 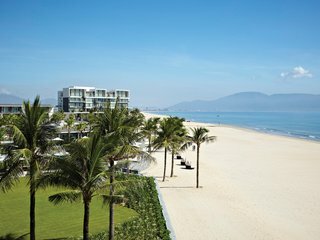 Hotels, resorts and restaurants are springing up along the beach, as Danang is transformed into the next big resort town to rival Nha Trang. Not to be missed while in Danang, about 8 kilometres south of the city, is the alluring cluster of 5 mountains known as the Marble Mountains or Ngu Hanh Son in Vietnamese. Each of the mountains was named for one of the five elements: metal (Kim Son), wood (Moc Son), fire (Hoa Son), earth (Tha Son) and the highest and most beautiful mountain, water (Thuy Son). The mountains are riddled with easily explored caves and tunnels. Some of the caves are ancient places of worship, some for Buddhists and others, reflecting the Cham heritage, to Hindu deities.